 Join celebrated writers, film makers, rappers, photographers, story tellers and locals to listen, talk, learn, rap, discuss, watch, question and share ideas on Palestine at the inaugural Tottenham Palestine Literature Festival, Thursday September 29th to Sunday October 2nd. The festival has been organised by Haringey Justice for Palestinians. We would like to thank everyone who has helped it to grow and flourish over the last few months. This will be a great four day event celebrating Palestine though films, discussions, art wiork, story telling, stalls, music and poetry. Can writers bring about political change? aimed at children and young people, 5 – 12 years. A morning of poetry & prose recital over a delicious brunch for this festival finale with Anwar Hamed, Ghada Kanafani, Emily Churchill & you!